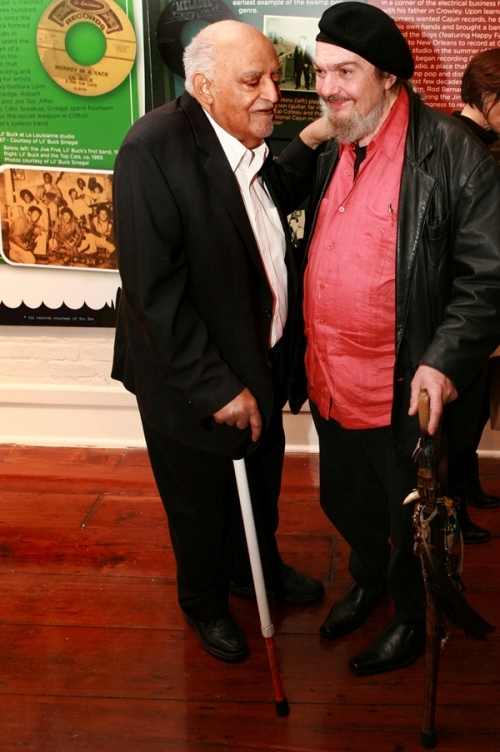 Wardell Quezergue chats with Mac "Dr. John" Rebennack at the Ponderosa Stomp's "Unsung Heroes" exhibit at the Louisiana Cabildo. If the greatest measure of a man’s success is a view of what the world might have been like without him, Wardell Quezergue’s presence on God’s Green Earth has to be counted as one of the music world’s greatest blessings. Like his colleagues Dave Bartholomew and Allen Toussaint, Quezergue single-handedly shaped the sound of New Orleans; his arrangements and productions of songs like Professor Longhair’s “Big Chief,” Robert Parker’s “Barefootin,’” Willie Tee’s “Teasin’ You” and the Dixie Cups’ “Ike Iko” define the very essence not only of a city’s music, but its very culture. Unlike Bartholomew and Toussaint, Quezergue never strove for a singular sound: in 1961 he helmed the Earl King Imperial sessions that produced raw gems like “Trick Bag” and “Always A First Time,” songs that could only have developed in a city where spectacularly attired Mardi Gras Indians and renegade brass bands rule the back streets. Ten years later, his arrangements of King Floyd’s “Groove Me” and Jean Knight’s “Mr. Big Stuff” split the difference between Memphis and New Orleans and put the sound of those cities’ crossroads—Jackson, Mississippi—on the map. Now considered as essential a stripe of southern soul as Muscle Shoals, Memphis or New Orleans, the Jackson sound existed previously in pieces, but it took the sweeping hand of “the Creole Beethoven” (as Toussaint so memorably refers Quezergue) to drive it into the charts. The fact that both hits were recorded on the same day attests to Wardell’s legendary work ethic, as well as the man’s unquestionable musical genius. Developing his arranging style in the service using a tuning fork, Quezergue cut his teeth with Dave Bartholomew before forming the Royal Dukes Of Rhythm and Wardell and the Sultans in the late ‘50s. Waxing sides such as “The Original Popeye” (as well as producing the aforementioned Earl King sides) for Imperial, when the company divested from New Orleans, Quezergue had already made his mark with the Watch, Rip and Frisco imprints, with incredible local hits like Danny White’s “Kiss Tomorrow Goodbye” and the Rouzan Sisters’ “Men of War.” In 1964 he partnered with Clinton Scott and Ulis Gaines to form Nola Records. Hitting immediately with Robert Parker’s “Barefootin,’” under Quezergue’s watchful stewardship Nola amassed a staggering catalog of soul and R&B—from the obscure Charles “Soul” Brown to the famed Willie Tee—before its untimely demise in 1968. Along with subsidiaries like Bonatemp, Whurley-Burley and Hot Line, Quezergue kept himself busy with productions for smaller labels like A.B.S., Shagg and Mode, always using the same modus operandi: the song itself came first. Despite Malaco Studio’s proven track record with Floyd and Knight, Dorothy Moore’s “Misty Blue,” christened with a beautiful arrangement courtesy of Wardell, was too far of a stretch for Atlantic. Faced with bankruptcy, Malaco released it themselves in 1975 and Quezergue racked up one of his biggest successes: the song hit number three on the pop charts and redefined the southern soul sound just as disco was beginning to steamroll it. A quiet giant, Quezergue continues to work in New Orleans, content to do what he’s always done: unassumingly make music history. For more on Quezergue, read here.